Is the Lucky Charms Cereal Nutritious? Lucky Charms, an oat-based cereal with firm marshmallow pieces, may be magically delicious— as the leprechaun in the iconic commercials claims — but it is also quite nutritious. 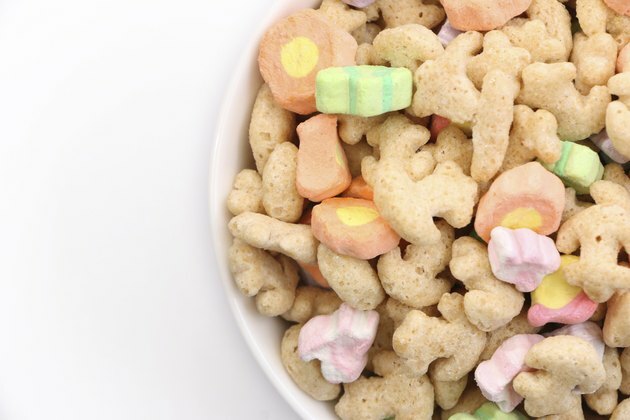 General Mills introduced this cereal in the 1960s, and since the federal government mandated the vitamin and mineral enrichment of flour in 1941, Lucky Charms has always been a good source of vitamins and minerals. It does contain a fair amount of sugar, however, so this healthy breakfast cereal may not be a good choice for everyone. A 3/4 cup serving of Lucky Charms contains 110 calories. Adding milk adds calories, although you may require more calories to adequately jump start your day: Go Ask Alice, Columbia University's health Q&A internet service, notes that your breakfast should contain 350 to 500 calories. Lucky Charms cereal has 1 g of fat as well, which does not account for much fat in your diet. You should not consume more than 20 to 35 percent of your calories from fat. One serving of Lucky Charms cereal provides 22 g of carbohydrates, a macronutrient your body uses primarily for energy. You should consume 130 g of carbohydrates per day, although your needs may differ if you have a particularly active lifestyle. You will also consume 2 g of protein per serving. Adding milk to the cereal does bolster your protein intake somewhat. Eating a bowl of Lucky Charms helps you get the folic acid you need each day, as one serving contains 50 percent of the daily recommended intake. This is important if you are pregnant or trying to get pregnant, because folic acid helps prevent some birth defects. One serving also provides 25 percent of the thiamin, vitamin B-6, zinc, iron, vitamin B-12, riboflavin and niacin your body requires each day, as well as 10 percent of the daily recommended intake of vitamins A, C and D and calcium. While Lucky Charms does not contain high levels of sodium, it does contain enough to be noteworthy. A serving contains 190 mg, and this amount may contribute to your risk of elevated blood pressure if you eat a diet high in this mineral. You should limit your intake of sodium to 1,500 to 2,300 mg per day. In addition to high blood pressure, the sodium in Lucky Charms can increase your risk of water retention. One serving of Lucky Charms cereal has 11 g of sugar, or 19.1 to 43.6 percent of the recommended daily limit. An excess of sugar in your diet can cause you to gain weight. Too much sugar in your diet can also contribute to tooth decay, resulting in cavities and other dental problems.